I love Draughts (Checkers), but in the past had one problem with them. During my pedagody studies I had internship at the community day center. There was a draughts set, and of course kids were playing. Unfortunately it was a source of many conflicts, because kids quarreled about rules. Can you capture backwards? How do you move King? What to do when someone forgets about capture? When piece is crowned? And so on and so forth. Kids’ doubts were partly fueled by the Internet. There were always someone who “played on the internet this way” and he was sure about the “only right” rules. Why Draughts rules were such big problem? Well… Draughts is a game known by many people, but few people study the game deeper. I would say that although almost everyone can play Draughts, there are more people playing seriously chess or go, but not Draughts. Everyone more or less knows Draughts rules, but not everyone knows them well. Besides … there is another problem. Draughts is not one game. This is a family of games. I will not elaborate here about the history of draughts. I’ll just mention that this game in today’s version appeared in the XV century, so it’s really old. The first known publication on Draughts is dated 1547 (the “El Ingenio about juego de marro, de punta about damas” by Antonio de Torquemada). What happens if a game is known for so long and it spreads throughout the world? Of course there are many variations. Today there are international Draughts, Brazilian Draughts, Thai Checkers, Russian Shashki, Italian Draughts, Argentinian Draughts, Turkish Draughts etc. I can enumerate more than 20 variants of Draughts, and probably that’s not all. There are also many games like Draughts, however I would not call it Draughts. So let’s answer a simple question. When particular game can be called Draughts (or checkers)? Let’s start with the fact that there is a common set of rules for all types of draughts games. All draughts games have the following common rules. The game is played on a board similar to a chessboard. At the beginning of the game, each player has equal number of pieces. This pieces are often called Men. The aim of the game is to capture all opponent’s pieces or block them (situation where your opponent can not move). Normal pieces (Men) can move to an adjacent unoccupied square. Mostly diagonally, but there are variants, where pieces can move on a straight line. Capturing is mandatory – it is a very important element of Draughts that allows stronger players to sacrifice some pawns in order to achieve a more favorable position on the board. The obligation of capturing is the basis of checkers strategy and tactics. It’s possible to capture many enemy pieces at once, making few jumps in a row. You can change direction during such jumps. A piece reaching the last row becomes King. We say it is crowned. It acquires additional powers (he has more options of moving). Rules of moving. Generally pieces can move diagonally, but there are also “orthogonal draughts“, where moves are performed in a straight line. Capturing – player must capture the maximum possible number of pieces, or he can freely choose capturing sequence. Rules that applies to King. After this brief introduction, I’d like to show you rules of a few selected draughts games. I can’t just describe all Draughts variants here. There are variants that I want to describe in a separate texts. Therefore, in this article I’ll explain a few basic variants of Diagonal Draughts – those in which pieces always move diagonally. Variants described here are those that can be played on ordinary chess board, having 64 fields (8×8). Other variants (orthogonal, enlarged or “twisted”) are described in other articles. 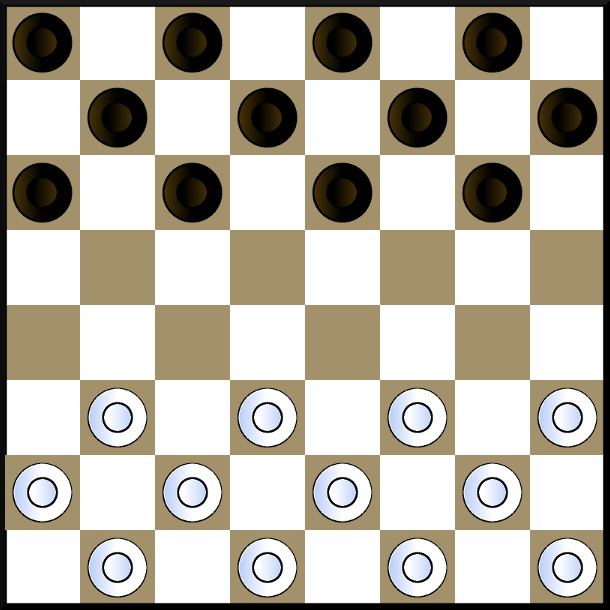 Brazilian draughts are also known as minor Polish draughts. What’s interesting, in Poland they are called “classic draughts“. The game is played on 8×8 board with 12 dark pieces and 12 white pieces. Set of rules for this game is also known as “international rules” because the same rules are used in international 10×10 Draughts. Initial setting of pieces is shown on the diagram below. The game is played on the dark fields. Position of the board is correct if the field in the lower left corner is dark. There’s so called “flying King” in Brazilian draughts. It means King moves any number of squares diagonally forwards or backwards. After completion of the capturing King can land on any field behind the captured piece. Piece is crowned (it becomes King) only if it finishes his move in the last row. In the situation depicted on the diagram below, man does not become King, since the last capture will “bounce” him back from the last line. Russian draughts or Shashki (шашки) is a variant popular in Russia and the countries of the former Soviet Union. It is also known in Israel. The rules are nearly the same as in the Brazilian draughts with two exceptions. Man is crowned just after reaching the last row. 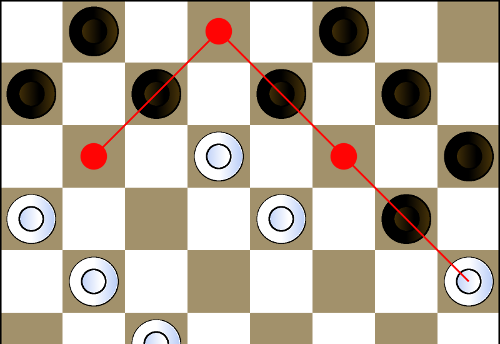 If a piece reached the last row during a capture move, it may continue this move as a King – he is immediately crowned and then jumps backwards. In Poland, the pool checkers are also called “traditional draughts”. But this is American game. In the USA, they are also known as “Spanish pool”. Apparently in the past it was a game of black US citizens. The player who play dark pieces moves first. Men move forward but can also capture backwards (as in Brazilian and Russian draughts). If there are many possibilities of capturing, player chooses any sequence. There is a “flying King”. It moves any number of squares forward and backward diagonally. Piece is crowned if it finishes his move in the last row. In short – the pool checkers are similar to Brazilian checkers but player who play dark pieces begins the game and there’s no obligation of capturing maximum amount of the opponent’s pieces. In the American Checkers number of pieces, initial setting and the board are the same as in the Brazillian, Russian and pool checkers. The differences are as follows. The player who plays dark pieces moves first. Men move only forwards and capture only forwards. Player can choose any capturing sequence. There is no need to capture maximum amount of opponents’ pieces. As you can see, King in checkers is not as strong as King in Brazilian or Russian draughts. Men capture in only one direction (forwards) and this limits players possibilities. Italian checkers (or Italian draughts) are known not only in Italy but also in North Africa. In fact, they are considered to be a variant of American checkers. To play Italian checkers you need 8×8 board and 12 pieces, but the board is set differently than in the Brazilian or Russian draughts. The field in the lower left corner is white, not black. Game is played on dark squares so initial setting looks like on the image below. Men move and capture forwards only (diagonally of course). There’s no flying King. Crowned piece can move one square forwards or backwards and can capture forwards and backwards (as in American checkers). King can’t be captured by a man (its typical for Italian Draughts). It is compulsory to capture the maximum amount of the opponent’s pieces. It means you have to capture the greatest number of pieces, and if in two possible sequences you have equal number of pieces, you should capture a King (of course if you have a King to capture another King). In the past in the Italian Checkers there was so called “huffing rule” (if a piece that must capture does not do so, the opponent may take it before his own move). This rule was stricken from the official rules. Thai draughts are really popular in Thailand and they are known there as Mak-hot (หมาก ฮอส). In Poland this game is known as “fast draughts” or “two-line draughts”. You’ll see why. The game is played on an ordinary chessboard with dark lower left corner. But this game uses just 8 pieces for each player. You can see the initial setting on the diagram below. In this variant of Draughts you can deeper “reorganize” your army before a first contact. It’s very interesting. There is a “flying King”. Crowned piece moves any number of squares forward and backward diagonally. There’s only one limit. If King captures, it must land just on the next square after the captured opponent piece. The game ends in a draw if there was 25 King’s moves without capturing. Alternatively, if only Kings remain on the board it can be established, that the winner is a player who has more Kings. 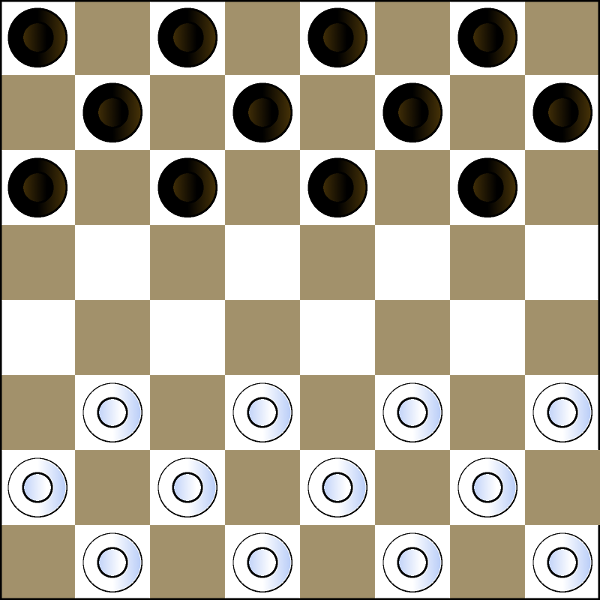 In the Spanish draughts (don’t confuse them with “Spanish pool”) the board position is identical to the Brazilian, Russian and American draughts (lower left corner is dark). But this game is played on the white squares, with 12 pieces on each side. Look on the image below. Men move and capture forwards only. There is a “flying King”. Crowned piece moves any number of squares forward and backward diagonally. It is compulsory to capture the maximum amount of the opponent’s pieces. If you think that I have described many variants of 8×8 diagonal draughts then you are wrong. There are more variants which differ from these in small details. For example, there are Jamaican draughts – the type of pool checkers with different crowning rules. 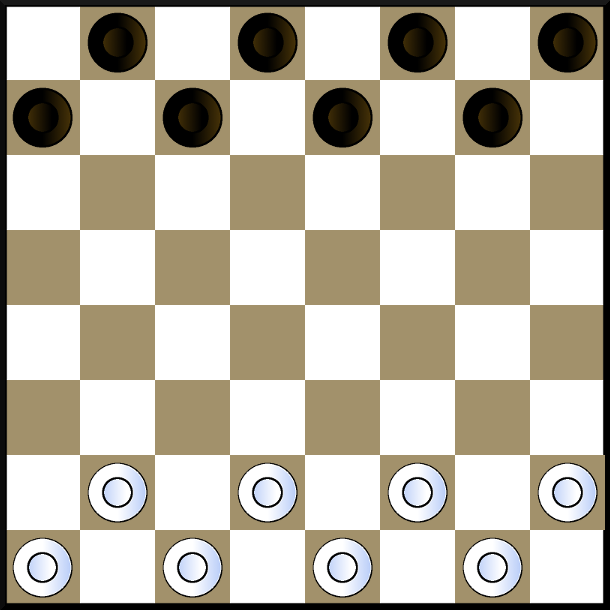 There are Argentinian draughts similar to Spanish, but with different way of King capturing (similar to Thai checkers, where there is an obligation to stop the field after captured piece). As you can see, there are many abilities to compose different rules and we are talking only about the diagonal 8×8 checkers. There are also variants of checkers played on boards of different sizes – 10×10, 12×12 and even 8×10. Furthermore, there are orthogonal draughts, where pieces move in a straight line. As a Pole, I have to answer last, important question. Are there Polish draughts? Yes, and this game is even considered as most noble game of Draughts. It is serious mental sport, like Chess. Polish draughts are also called International Draughts. I’ll write about them soon.